Today we’d like to introduce you to Javondlynn Dunagan. Javondlynn, please share your story with us. How did you get to where you are today? I retired in January 2016, after a successful 25-year career as a United States Probation Officer in Chicago, Illinois. Throughout the majority of my federal career, I opted not to carry a firearm due to a long-held fear of firearms. In fact, I signed up three different times for the class throughout my career only to cancel at the last minute due to my fear of firearms. Following my divorce from a policeman, I started to feel unsafe at home without a firearm. As a result, I immediately signed up for the next training class at my job. Upon completion of the class, I finally conquered my fear of firearms and actually fell in love with shooting. In an attempt to become more proficient with my shooting skills, I struggled to find a partner to go shooting with on the weekends. My coworkers at the time were busy and a solo trip to the gun range was intimidating. On one occasion, I recall visiting a suburban gun range where I encountered insensitive gun store employees, unsafe range incidents, and cocky male patrons. Although I did not qualify to carry a firearm until the last few years of my career, I felt confident enough to purchase a personal firearm after retirement. After purchasing my first firearm, I decided not to wait for anyone to accompany me to the range. I started going by myself on a regular basis. I never saw another female by herself or a group of ladies at the gun range. As I became a weekly regular at the gun range, I grew more confident navigating the male-dominated gun world. 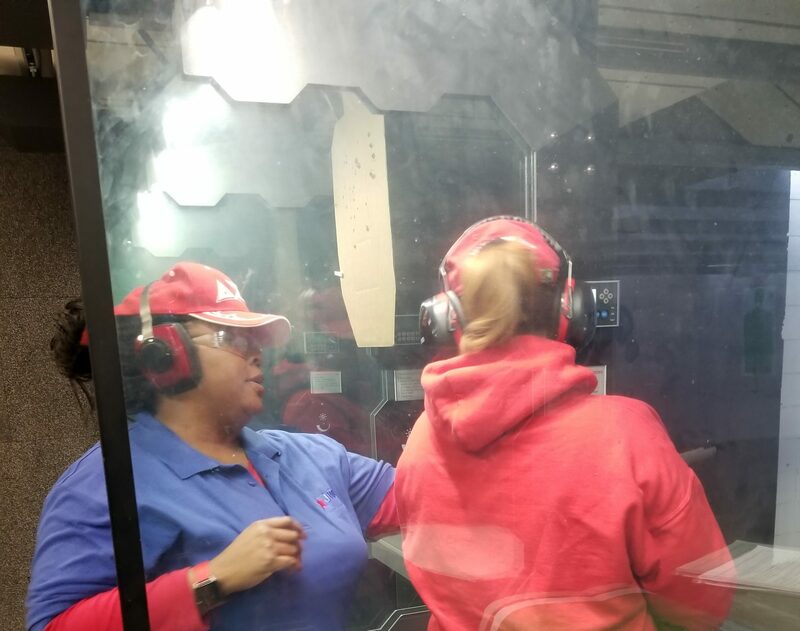 Sightings of females at the range were extremely rare and the comments were becoming all too familiar “are you here by yourself?” or “are you waiting for instruction?” Additionally, I took a gun cleaning class and was the only female in the class. My holistic approach to safety is designed to empower women to take responsibility for their own personal safety through a self-defense class and/or firearms education classes. 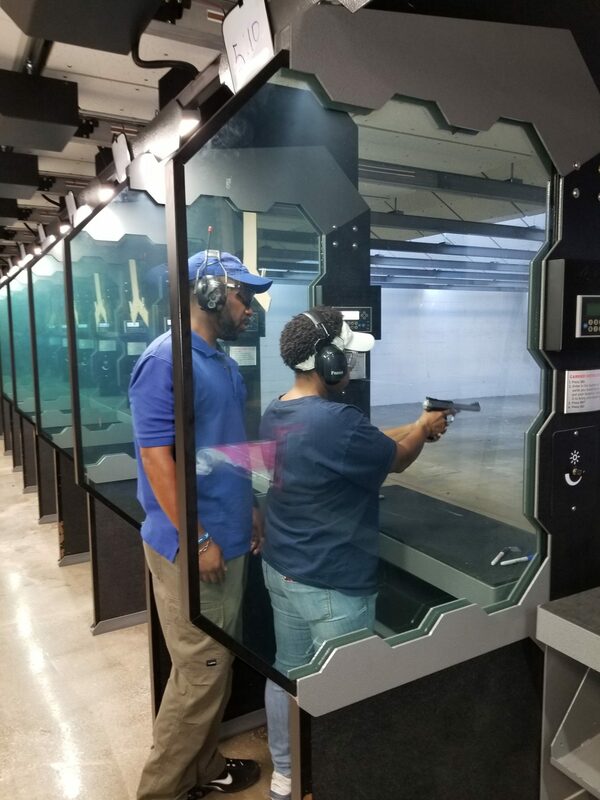 My business opened in March 2017 and we offer an Intro to Firearms class for beginners or as a refresher and Illinois Concealed Carry classes. Classes are open to men as well. I also included self-defense classes in my business vision. As my daughter was preparing for college, I could not find any self-defense classes for girls on the south side of Chicago. The available classes were far north or in the northern suburbs. My self-defense classes also include moms and daughters, college-bound girls and adult women. I am the founder of the Ladies of Steel Gun Club in Chicago, IL. 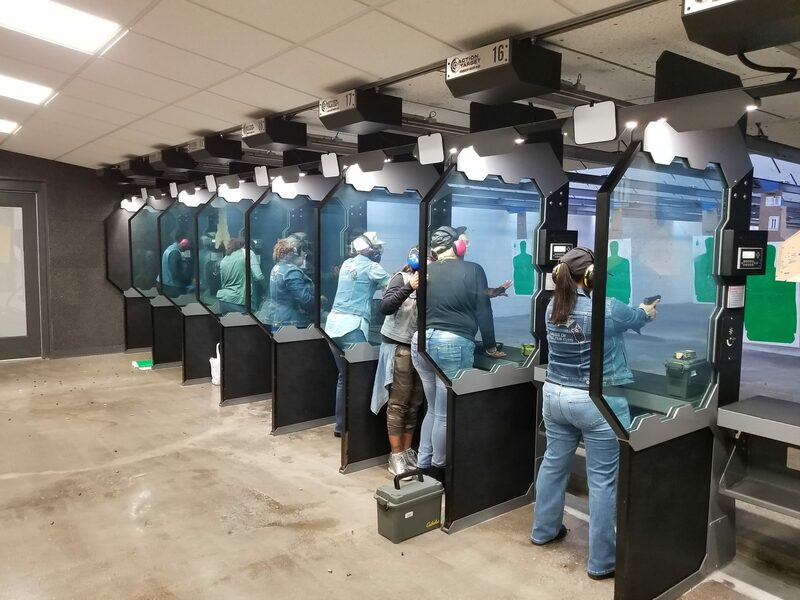 We have 78 ladies and counting and we are the only gun club in the Chicagoland area. The gun club members meet up monthly to shoot Eagle Sports Range and we meet monthly to receive ongoing firearm education. I also offer Live Scan electronic fingerprinting for background checks, licensing, or concealed carry applicants. I am an NRA Certified Firearms Instructor, NRA Certified Range Safety Officer, and a Certified NRA Refuse to Be A Victim Instructor. I have dual City of Chicago Minority and Women-Owned Business Certification. 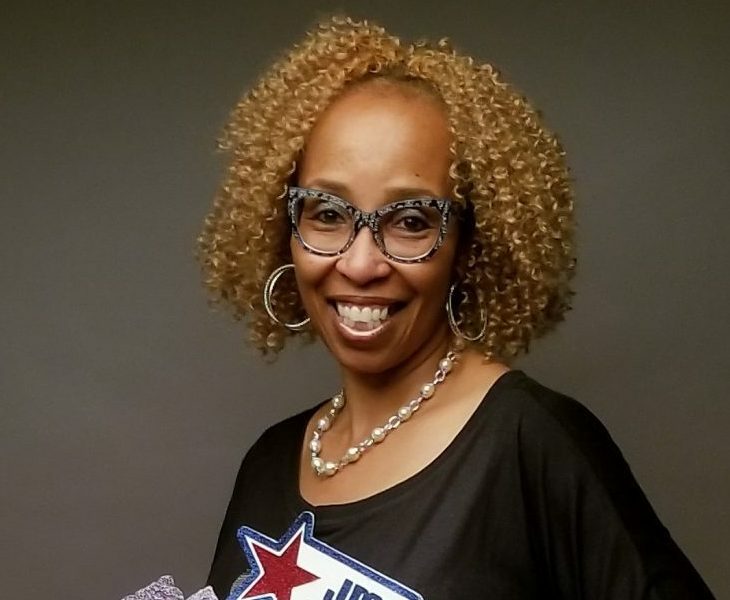 I have a Masters’ Degree in Social Service Administration from The University of Chicago and a Bachelor of Arts Degree in Social Work from Hampton University. The struggle has centered around being a female in a male-dominated sport. When our members show up to shoot, some who are not familiar with our monthly shooting meetups give us odd looks. I believe they are surprised to so a group of women successfully navigating the gun range. Also, some of the guys are probably not used to seeing two female NRA firearm instructors as we assist our members on the range. Also, when a few of us went to a gun show and an outdoor gun range in rural IL and Indiana, we are noticing that some are not show what to make of these African American women who stand out like a sore thumb. Once the guys figure out that we know how to shoot and talk all things firearms, instant credibility occurs….. well sometimes. So, as you know, we’re impressed with JMD Defense & Investigations, LLC – tell our readers more, for example what you’re most proud of as a company and what sets you apart from others. 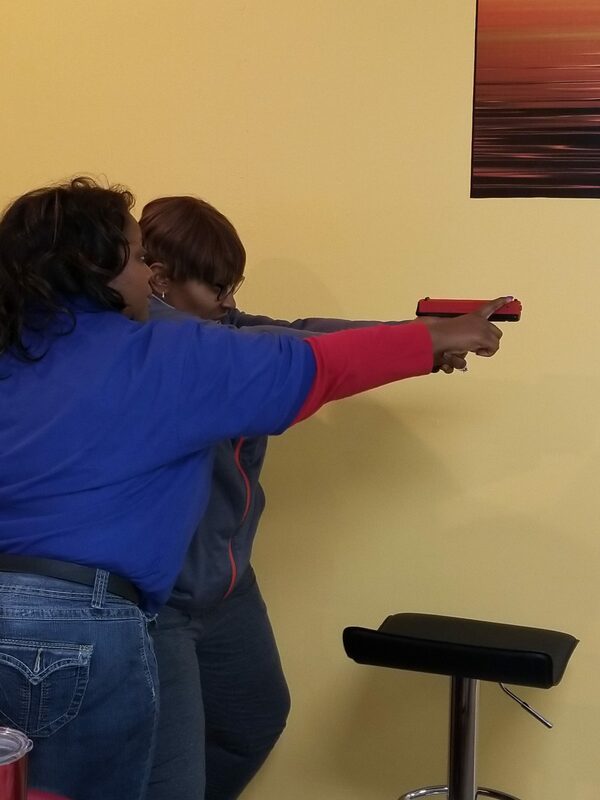 I specialize in firearm education classes for males and females. I offer an Intro to Firearms class for beginners or as a refresher course for anyone who is already a little familiar with firearms. The Concealed Carry classes are offered over the course of two days. Self-defense classes for ladies include: a Mommy and Me class, Teen Girls Self Defense, Before She Goes to College and Ladies Self Defense class. I am most proud of the Ladies of Steel Gun Club. Our first meeting included eight members and we have grown to 78 ladies in less than a year. We can shoot and we look cute. We wear blinged out denim jackets and have cute t-shirts with our gun logo on them. Our members range in age from 25 to 80. We range in experience from no experience to regular shooters who wanted to join a club with like-minded women who want to learn responsible firearm handling. What sets me apart from others is that my business mission and vision is to tackle safety from a holistic standpoint. Safety training should be ongoing. My class sizes are small (maximum 12) which ensures that our students receive one on one attention in class and all of their concerns and questions are asked before they complete the class. By offering self-defense classes for kids and moms, teens, college girls and adult women, I am promoting safety for ladies from 8-year-olds to seniors. 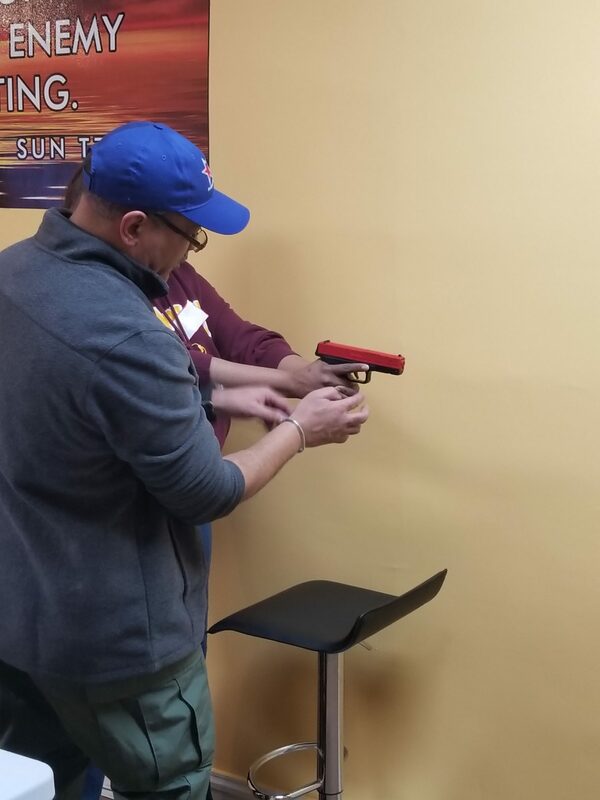 My firearm classes include interactive training with a laser pistol which helps our students to learn the fundamentals of handling and shooting a firearm, coupled with movie clips and visual learning aids. Our 122 slides from our powerpoint handout is full of firearm-related resources and concealed carry information which our students truly appreciate. We have a 100% success rate and our students have provided very positive feedback following our classes. Chicago is a city rich in a large variety of activities from the north to the south and throughout the various suburbs. Boredom will never set in for a Chicago resident or visitor because of the voluminous offerings for the nightlife, museums, eateries and shopping choices. I do not like the segregated communities and school system. We need our schools and communities to be much more diverse as well as the allocation of resources throughout the various communities.